Printit4u use special roll fed print machinery for printing of your pads which makes us extremely competitive when compared against traditional sheet fed machinery.You can have duplicate, triplicate or quad sets and we can print in single colour or full colour if required. Printit4u have free templates of common requirements such as invoices and receipts, and we can easily adapt these for your needs. 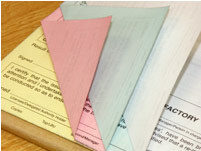 NCR Pads are sets of carbonless forms tipped glued to a sturdy backboard. 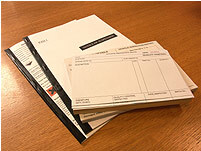 NCR business forms are essential to keep a copy of wriiten records and signatures. They are particulary useful for delivery merchants that want to leave a wriiten copy of their delivery and need to retain a signed acceptance from their customer. Typical sizes are A4, A5 and A6, but we can custom make to any of your size requirements. 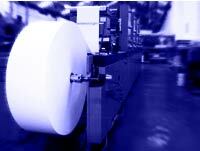 Printit4u specialise in the ncr printing of multi-part printed Pads. Using specialist web roll-fed machinery we can produce volume runs cheaply for any size of pads, and if required, we can sequentially number your forms. We have fast turn around times, the lowest prices, and the highest quality business form printing. Please complete the following form and press submit for your fast no obligation online quote. We offer a nationwide service and trade printing enquiries for your business forms are welcome. No. (We have FREE templates we can adapt for you) Yes.